What does “Commander-in-Soy” versus “alpha” mean? Today’s (January 26th) Washington Post reported President Trump’s decision to end the government shutdown under the headline, “Trump caves” or “Genius.” : Right wing splits after Trump ends shutdown with no wall funding. “Some is the key word here, however. While Mike Cernovich, a far-right online personality, tweeted that Trump was now the “Commander-in Soy” and that Pelosi was “alpha,” others rallied around the President. 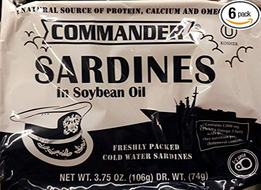 Apparently the word, “Commander-in-Soy” seems to be used in negative or derogatory nuance vis-à-vis “alpha” for Nancy Pelosi, but I’m not able to relate soy to Commander-in-Chief. Protein derived from the beans of an Asian plant. And I don’t see any headings of “Commander-in Soy” on google search. "Alpha," I know what it means. But What does "Soy" here mean? Can the word, “soy” be acceptably used in such a way as “Commander-in–Soy,” or “Someone who's a kind of Soy.”? The usage is Commander-in-Soy, which is a play on words on the president's role as Commander-in-Chief of the U.S. Armed Forces. Note that Soy is capitalized in this usage. It means that Trump displayed weak, "feminine" characteristics by backing down on his pledge not to end the shutdown without wall funding. Soy is thought by some, perhaps more on the right side of the US political spectrum, to cause "male breasts" and other feminine characters. See articles such as Can Soy Feminize a Boy? Soy is making kids "gay"
Alpha refers to being the alpha male or leader of a pack, and this role has been given to Ms Pelosi, who led the Democratic Party opposition to the continued shutdown. This represents another "role reversal" as far as gender is concerned. Not the answer you're looking for? Browse other questions tagged meaning phrases politics cultural-phrases or ask your own question. Is it a common way to use “heartland” as in “give a heartland shout-out / comment to somebody”? Is “Something in the sand” a popular English phrase? Does “walk back” have a meaning of ‘deny’ or 'keep distance from somebody / something.' as an idiom? What does “waste not, want not” mean? what does “line ministries” mean? What does “triple down” in “Trump triples down on George W. Bush’s responsibility for 9/11”mean? Why does “the one” pass as the moniker of President Obama? What does it mean? What does 'erect galleries' mean in the political context?